The Meister Adult 180" Hand Wraps are full-length and ideal for MMA, Boxing, Muay Thai and other combat sports. These wraps are ideally designed to allow you to wrap a full 180" of wrist support, hand support and knuckle protection without adding too much bulk under your gloves. Constructed from a high quality cotton and spandex blend, Meister wraps also provide ideal comfortable support, allowing you to wrap to your desired tightness. Featuring an oversized velcro strap and strong thumb loop, these wraps will stay snug and secure all workout long. This 3 Pair Pack includes Black, White & Red pairs (6 wraps total), and includes care instructions. 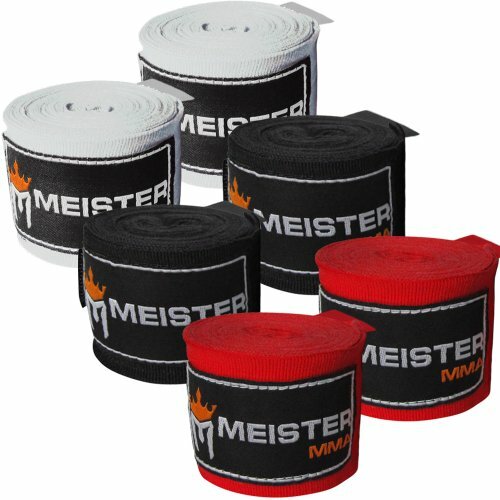 A must for any fighter, boxer or martial artist, Meister hand wraps are the gold standard for high quality, support and value.